Dry Eye Syndrome (DES) affects millions of people and is one of the most common reasons for visiting the ophthalmologist. Symptoms of dry eye range from mild irritation and foreign body sensation to debilitating pain and redness with decreased vision. 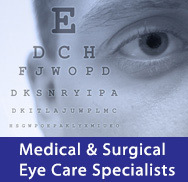 Our physicians have extensive training and experience in the management of dry eye for all levels of severity. Dry eye syndrome has many different causes. Our first goal in the management of dry eye is to accurately diagnosis the cause for each patient utilizing specialized testing and a thorough examination. Next we can focus our treatment to optimize each patient’s outcome based on this information. The treatments for dry eye are diverse and range from the use of artifical tears to anti-inflammtory drops as well as the use of various procedures including punctal plugs or even eyelid surgery in severe cases.